After a great weekend of marketing and cooking there are always random leftovers, my solution (and I am sure you will be SHOCKED) is to make pasta sauce. The other night I realized I had 2 tomatoes and four grilled cobs of corn. Clearly the answer was to slice the tomatoes thinly and layer with olive oil, garlic, and crushed red pepper for about 20 minutes (flipping the tomatoes halfway through). While the tomatoes rendered themselves into a chunky, bubbling sauce I cut the corn off the cobs, I had to break the kernels apart with my fingers to not end up with 7 inch pieces of corn kernels. Once the tomatoes were completly broken down I added the corn and a few shakes of salt, and covered for about 10 more minutes. 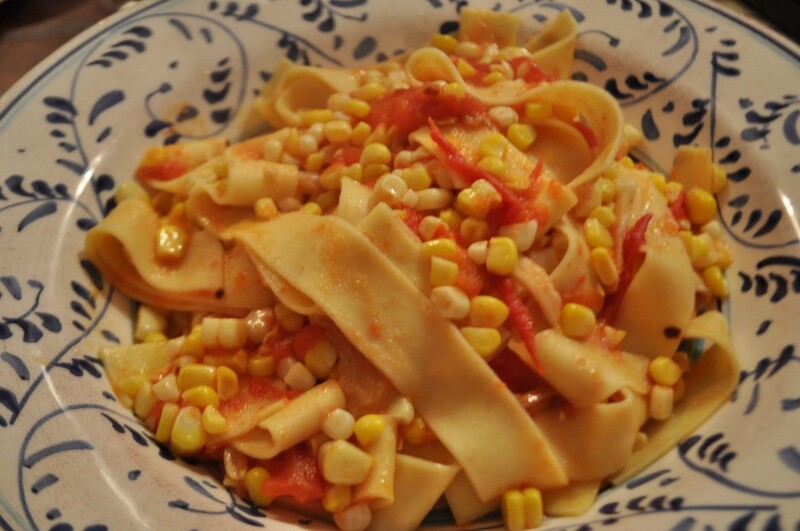 Since this sauce is so quick I started the pasta water boiling when I put the tomatoes in the pan, and added the pappardelle when I added the corn to the sauce. A quick sprinkle of Parmesan as the plates went to the table (with a few more sprinkles as we ate our way through the bowl), and dinner was ready in just under half an hour, and it was delicious. This sauce would also be delicious over some grilled chicken, Quinoa, or even as a thick, fresh summer soup.